Vibrant and Colourful can only describe this lovely piece of ethnic Textile Art with beautiful stitch and embroidery. 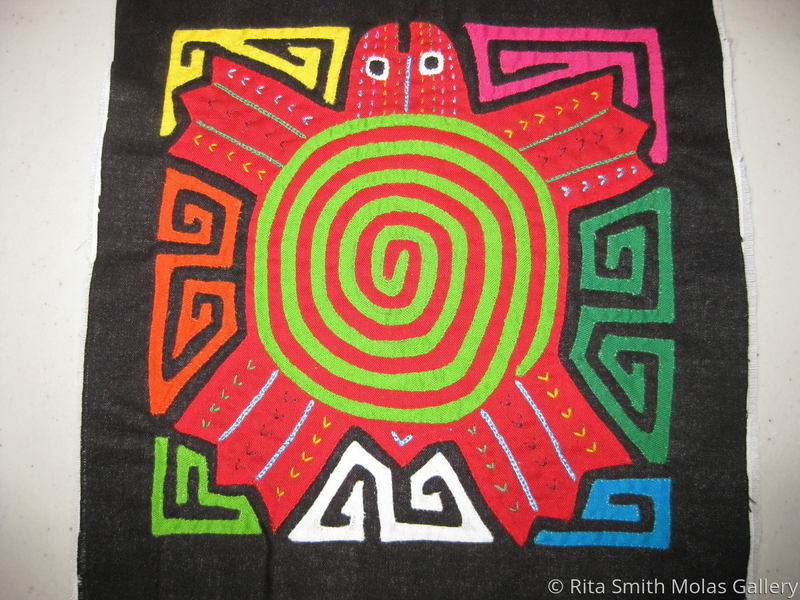 Molitas are entirely handsewn by a Kuna Indian Mola Maker on the San Island Kuna Yala, Panama. Size 8" x 8" in a black background 2 layers, the spiral color could be yellow, orange, green, blue, multi colors around the body of the turtle. This exquisite piece is authentic and genuine. Molas are unique and the most beautiful hand made art that you will love to treasure forever. Molas are a great motivation for a lesson on folk art, your students will be delighted. A perfect gift for anyone or add to your private collection. Molas will look gorgeous on any quilt project, craft project, make a pillow, a delightful wall hanging or bedspread, apply to a purse, handbag, t-shirt, vest, jacket, jean skirt, tote bag, or just framed, etc. Be creative & unique.